Strikers Are Overrated; Why Use Them At All? It’s a bit of a cliché, but it’s true nonetheless. Strikers are overvalued. 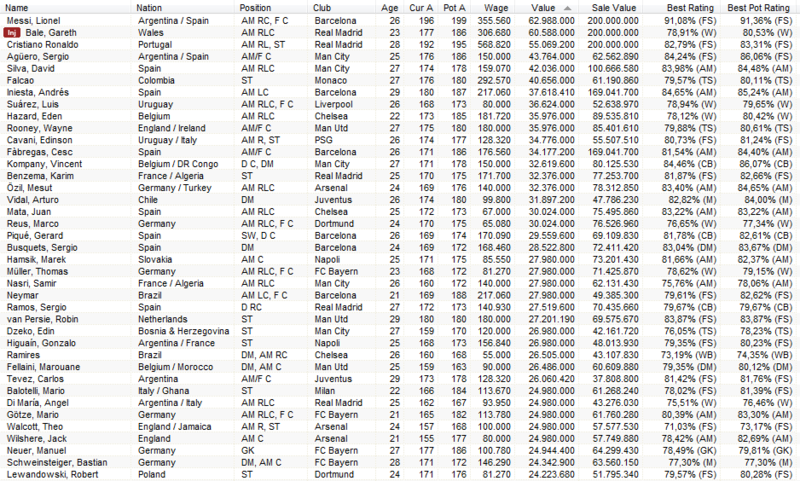 Just look at the top 20 of most expensive transfer fees. It’s pretty much self-explanatory. Whilst Bale is not an out-and-0ut forward, Ronaldo has developed into one the last few years. Four players in the top 10 are not actual forwards, whereas their number rises to seven out of twenty. The first defender on the list would have been Rio Ferdinand, in 21st position. This over-valuation is an example of the “availability heuristic”: the more available a piece of information is to the memory, the more likely it is to influence your decision, even when the information is biased. Goals tend to stick to mind, the goal-scorer tends to be the hero. The man who won the ball with a tackle tends to be forgotten, the man providing the assist tends to be forgotten, the goal-scorer sticks to mind as the victorious hero who won the day for his side. Most goal-scorers are forwards, hence they tend to be over-valued. So how does this compute in FM? Using FM Genie Scout, I was able to quickly establish a list of the most expensive players in FM, their respective positions and clubs, current ability, potential ability, actual value and sale value. Using FM Genie, I was able to quickly establish who were the highest valued players in the game and what their selling value was to their respective clubs. At the very top, the forwards still rule the roost, both in terms of transfer fees and wages. The amount of cash required to get a single world class forward can easily get you two or more players in other positions. The amount of cash required to keep a world class forward is tantamount to two or more midfielders or defenders. From a financial point of view, why would you even want to use a forward? Which is why I either us homegrown strikers or convert players with striker potential to that position. And then I scoop up as many good young keepers as I can, and sell them off after I’ve loaned them out a time or two.